Summer is all but officially over, yet our work with SPM Performance Monitoring, Alerting and Anomaly Detection and Logsene Log Management and Analytics is not. While lots of us took a well-deserved break over the last 1-2 months, we added a few goodies to both SPM and Logsene. More interesting stuff is coming in the next release. You can now tell SPM where your Nagios lives and SPM will push all your Alerts to Nagios. If you use PagerDuty, SPM can push your Alerts there, too. Those sending large volumes of metrics will see the most benefit. The new agent makes use of Apache Flume to transport metrics. You can still use HTTP if you want, of course. These additions to SPM, along with recently announced monitoring support for NGINX Plus and NGINX make it an even more effective solution for organizations who are paying the unfortunate price of having a mish-mash of monitoring and alerting tools bolted together in an uneasy coexistence. If you haven’t seen SPM yet, we have a live SPM demo so you can see it for yourself. The demo shows Hadoop, HBase, Kafka, Elasticsearch, Solr, MySQL, Redis, and other types of apps being monitored. Until now you could create an unlimited number of Dashboards with SPM graphs, and now you can do that with Logsene graphs, too. 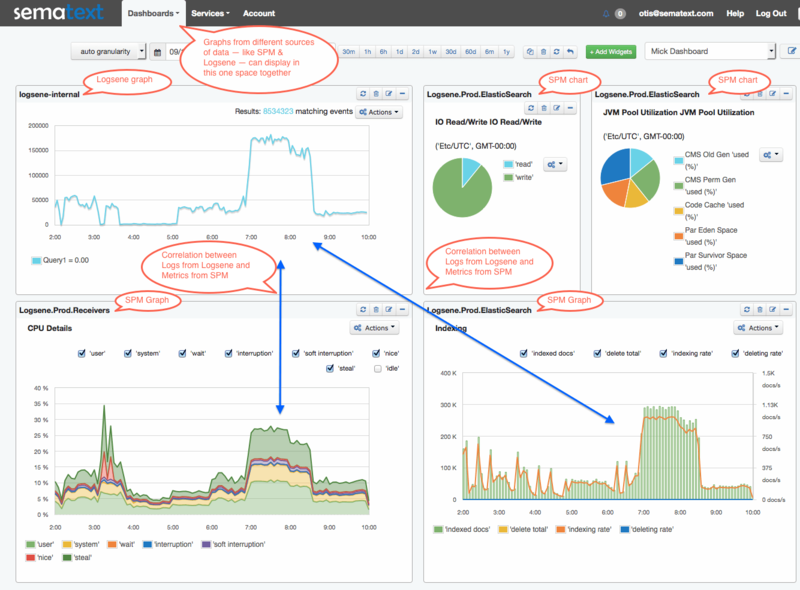 Moreover, you can place Logsene log graphs alongside SPM’s performance graphs, on the same Dashboard, and correlate your performance with your application logs! This makes the integration of performance metrics, logs, events and anomalies more robust for those of you looking to combine performance monitoring and centralized log management in one place — not only knowing that SOMETHING happened when you look at your performance metrics graphs, but also exactly WHAT happened by having immediate access to relevant logs right there! Like what you see here? Sound like something that could benefit your organization? Then try SPM or Logsene for Free for 30 days by registering here. There’s no commitment and no credit card required. Poll: Which Log Shippers do you use?